Blue Camo Paracord Medical ID Bracelet with Blue Medical Emblem. All accessories for our medical id tags are made from non-allergic grades of steel and silver. If you cannot find product you need, please let us know by clicking here. "Blue Stars" Sport wrist band. 5 (five) Medical ID wallet cards (see quantity discount). A pack of two professional quality watch pins by Timex. 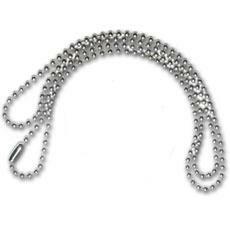 Stainless Steel Ball Chain for necklaces and dog tags. Stainless Steel Bracelet chain (.2" or 5 mm wide). Stainless Steel chain Bracelet (.4" or 10 mm wide). Stainless Steel Endless Curb Chain for necklaces and dog tags. Stainless Steel Key Chain 4" long. Wide Stainless Steel Bracelet chain (.4" or 10 mm wide).